Sipping champagne and staring at all the beautiful Montblanc watches, pens, and the latest Bespoke 25 Collection, the Montblanc store at the Beverly Center paired with Departures Magazine to honor Margaret Hyde for her outstanding support of Write Girl. If you have kids or you are an educator, you may know of Margaret Hyde’s “Great Art for Kids” series, such as Picasso for Kids and Matisse for Kids. I became aware of her when I was discovered one of her innovative children’s books called Mo Smells Red: A Scentsational Journey, that takes things up a notch with smells. The main character Mo is a rescued dog who experiences the colors of the world through his nose. Scientists say dogs are colorblind, so Mo’s heightened sense of smell is his only guide through his monochromatic world, enhanced with scents. Hyde is also a storyteller, a mother of three, and has been busy telling stories as a travel photographer, a publisher, a writer, and an Oscar-nominated documentary filmmaker. She has lived in Southern California since she moved in high school. WriteGirl is a creative writing and mentoring organization that promotes creativity, critical thinking and leadership skills to empower teen girls. 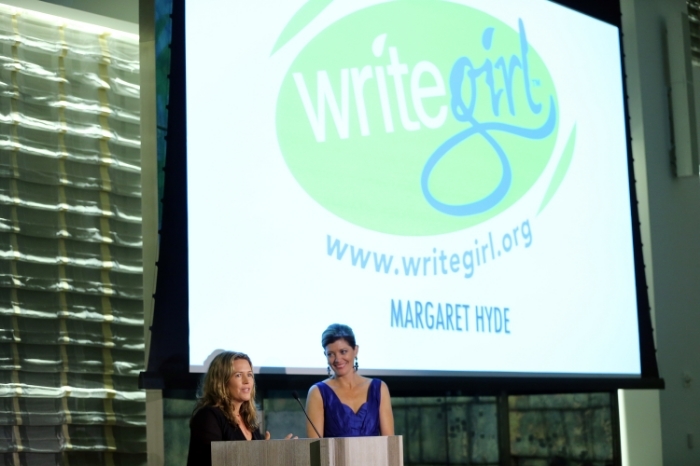 WriteGirl has a 13-year history. They welcome help and involvement from the community. WriteGirl isn’t an extra program or a supplemental program, it is essential and vital in helping girls not only graduate high school but also enroll in college. Never underestimate the power of a girl with her pen.